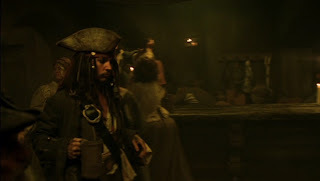 Snippets of Jack: "Lots of Rum, Lots of Women"
"Lots of Rum, Lots of Women"
One of our most recent post about romance inspired me to make another post about a happy couple not featured in our poll but definately noteablr: Esmeralda and Jack. We've talked quite a bit about their romance in the early chapters of The Pirates of the Caribbean: The Price of Freedom. Their romance buds when Jack is only twenty years old, and Esmeralda a few years older ;D. We talked about how together they crack the secret identity of the vicious rogue pirates. But just when their romance had begun, Jack gets forced aboard La Vipere, the ship of his ex-best friend. How very unfortunate. Esmeralda doesn't know at first that Jack as forced to leave. She becomes violently angry and storms down to their favorite tavern, the Drunken Lady, with a pistol to find him. It's not for a few more years that they ever meat again! 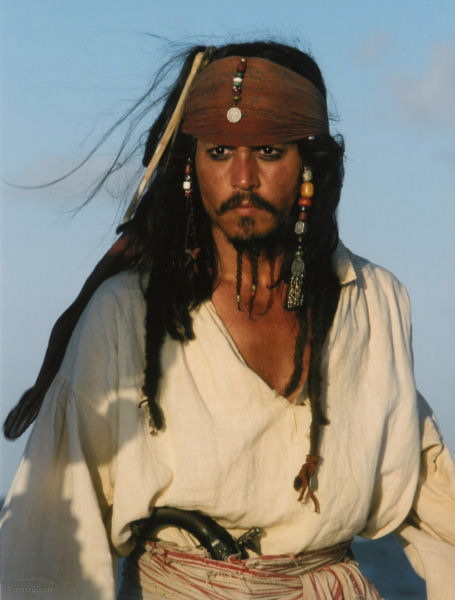 By that time Jack is sailing for the E.I.T.C., and Esmeralda is Pirate Lord of the Caribbean. They talk some but don't spend too much time together. Fate brings them together yet again! We've discussed this scene here in other posts, where Esmeralda's ship runs into the Fair Wind. The Fair Wind's captain dies and Jack becomes captain. During this time, Esmeralda shares with Jack how completely frustrated she was when she heard he had gone. 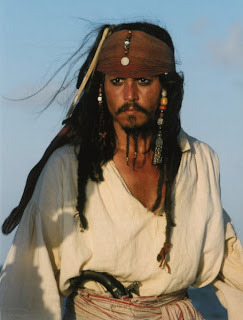 She is hesitant to forgive him, but who can resist Jack Sparrow? Exactly. No one. But their not done yet! About a year later, Jack is captain of the Wicked Wench, but his ship runs into some very bad damages after their vicotrious battle against the Koldunya. The ship is so badly damaged that Jack is worried about what could happen next. But at night, he hears a ship rowing by. 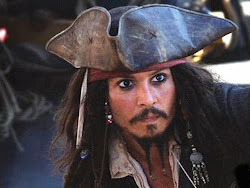 He is unsure whether or not he should call for help, in the event that the ship were run by dangerous pirates. But he shouts out anyway, and too his surprise: it is Esmeralda's vessel! You see, Esmeralda was tracking Christophe. She hoped that by finding the Koldunya, she would discover Christophe's location. Luckily, she was close enough that she found Jack! I'm telling you, these two are meant to be together. She and her crew greatly assist the Whench. Her doctor heals the injured, their crew repairs the damages, and they don't take ny of the goods. Sound suspicious for pirates? A bit, but that will be addressed later. The two boats stick together for several days, in which Jack and Esmeralda spend quite a bit of time together. It's clear to everyone on the ship that their not just friends. Esmeralda is also good friends with Robby Greene, Jack's first mate and current best friend. All three of them share a raging hatred towards Christophe, the rogue pirate. It is at that time that Esmeralda shares with Jack that he could be accepted back to the pirating world if he were to kill the two rogue pirates that he previously set free: Christophe and Borya. Borya died with the Koldunya, at the hands of Jack so all he had left was to track down Christophe! However, at this time Jack keeps secret from her that he really plans on striking up a deal with Christophe inorder to get the last magical bracelet to enter the labrynth of Zerzura. How Jack gets back into the pirating world unfortunately is yet to come. Once the Wench is ready to sail on its own, the two lovers say goodbye. Unfortunately, this is the last that we see of Esmeralda in the books. Although, most likely they meet again because she had to have passed on her peice of eight to Jack. I really really really hope to see her in the upcoming movie. If you haven't read the Price of Freedom yet you really should, because she really is one of the best parts of it!